One of my office mates at Envision Technology Advisors has been heavily involved with The Providence 48 Hour Film Project for years and I have always found it to be a fascinatingly cool idea. Needless to say, when I was recently asked to come up with a few ideas for logos / designs to be printed on t-shirts, hats, and other merchandise for the event, I jumped at the chance. It has been years since I had done much merchandise design, so I was excited not only to work with the 48 Hour Film Project, but also to do some merch design again. Many years ago, when I was involved in a band, one of my favorite aspects of my role with the group was the design and creation of the merchandise, but it had been some time since I had created any work with the primary intention of slapping it on a shirt. It actually felt good, and a bit nostalgic, to do this type of work again. In the end, I came up with two designs. One, which I refer to as the “I Made a Film” design, ended up being the one that they decided to move forward with. Interestingly, this particular design was more of an afterthought than anything. I spent most of my time designing the other logo I presented, and this one really began as a study in some different typefaces I wanted to use. 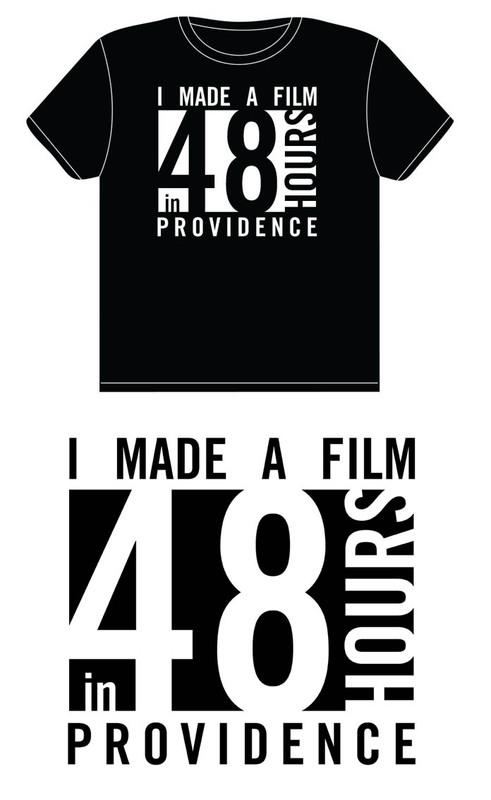 Playing around with some negative space led me to throw this design together and I eventually found myself really digging what I was working on and the way that the logo (depending on how you looked at it) read “I Made a Film in 48 Hours” as well as “I Made a Film in Providence.” I love little touches like that and I proudly wear this shirt all the time.